Sal’s Riverside Seafood ships live and pre-cooked Gulf seafood throughout the continental United States. As a trusted name in Louisiana seafood, we sell direct to the public as well as wholesale to restaurants, grocery stores, country clubs and more. We ship from Louis Armstrong Airport using Southwest Airlines, which allows you to track your order on swacargo.com. We do need at least 24-hour advance notice to be sure we get the right order to you on schedule. Whether you call them crawfish or crayfish, the Gulf season runs from about November through July, though the best times for live crawfish vary based on the weather in a given year. Luckily, Sal’s has you covered with live crawfish in-season and frozen crawfish year-round. We can send them to you with our in-house seasoning boil and all the fixings. We have a great range of options when it comes to blue crab. 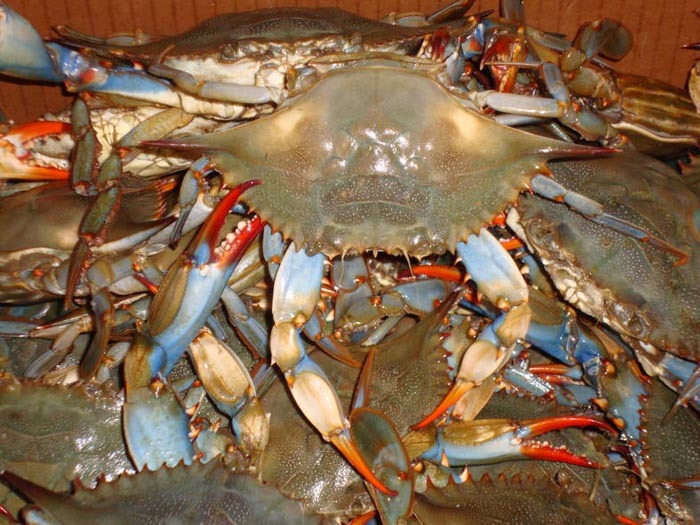 We can ship you live or boiled crabs, as well as jumbo lump and lump crabmeat. We also have claw meat and crab fingers available. Along with our classic Gulf blue crab, we are also proud to carry a range of softshell crab, from Extra-Large all the way down to Small, we have the soft shells to suit your need. When it comes to shipping shrimp, Sal’s Riverside Seafood is your one-stop shop. We can do head-on, head-off, peeled or de-veined shrimp. We can send standard frozen shrimp or 50-lb. boxes of Instant Quick Freeze (IQF) shrimp. Call Sal’s today at (504) 464-1100, and we’ll work with you to figure out the shrimp order that will satisfy your family, guests or customers! At Sal’s, we know that classic Gulf seafood along isn’t always enough to capture the full flavor of Louisiana. That’s why we supplement our great crawfish, crabs and shrimp with a range of other food to make your experience complete. We carry a number of sausage types, including our most popular Cajun Smoked Sausage, Alligator Sausage, Andouille and Green Onion Sausage. We also have boudin, a classic Louisiana sausage with rice, in varieties including crawfish, pork and shrimp. To round out your Louisiana food extravaganza, we can also send along alligator meat, Louisiana redfish and stuffed artichokes. Our Cajun Turduckens (a boneless chicken, in a boneless in a boneless turkey!) are extremely popular for holidays, as our specialty meats and stuffed fowl. Sal’s is committed to making each customer happy, so please call us today at (504) 464-1100! Give us a call to order yours now. Pick up the phone and ask us about current prices, ordering and availability. Don’t forget about our award winning seasoning and spices. Our secret family recipe has been handed down through the generations, and this adds a certain something to every type of Cajun seafood. You might find it difficult to make a choice from the great selection above, so why not order a number of different items and try out a variety of different recipes to see which one wows you? All our food is so delicious that we are proud to say our customers return to us again and again, year after year. Contact us to discuss your requirements. From the first phone call, you will experience our awesome customer service with friendly and helpful staff who will be happy to help you decide what you would like to order. We also offer fish and alligator meat. Contact us now to order delicious Cajun seafood that you will be craving often!